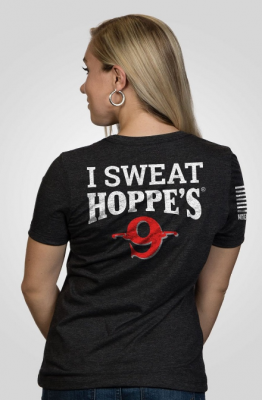 OVERLAND PARK, Kansas - Hoppe’s, the best known name in gun care products, is proud to announce a limited run of Nine Line Apparel “I Sweat Hoppe’s” T-shirts and sweatshirts. The new shirts are available exclusively online and for a limited time. Nine Line Apparel is a Savannah, Georgia based, veteran owned and operated clothing brand. With a tagline of "Relentlessly Patriotic", Nine Line is a “give-back organization” that outfits veterans, active military, first responders and their supporters. At its core, Nine Line says it aims to reinvigorate the sense of patriotism and national pride that is disappearing daily from our society. Hoppe’s, makers of the legendary gun cleaning solution Hoppe’s No. 9, serves shooters of all disciplines, and offers gun care products that meet the rigorous standards Frank Hoppe established more than 110 years ago. Available in several styles, “I Sweat Hoppe’s” shirts are only available while supplies last. Visit the website at www.ninelineapparel.com/collections/hoppes-9 to order one today.